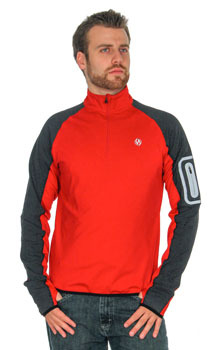 Men's Reflective illumiNITE Early Riser Pullover. The Early Riser pullover is your get and go top on chilly mornings when the seasons change. Keeping you warm inside and seen on the outside it's a favorite for layering or all by itself. Excellent Comfort, Warmth and High Visibility! I run on the street with a pretty heavy traffic flow. Living in New England, it gets dark pretty early in the fall and winter months. I love the IllumiNITE brand because it's the best visibility I've seen in running gear. This pull over is very comfortable and so far has kept me warm in the low 40s. It has a zipper on the arm to hold a key or some cash. It also has thumb holes so keep your hands warmer. The visibility is like nothing I've ever seen. Cars were getting out of the way from much further away.